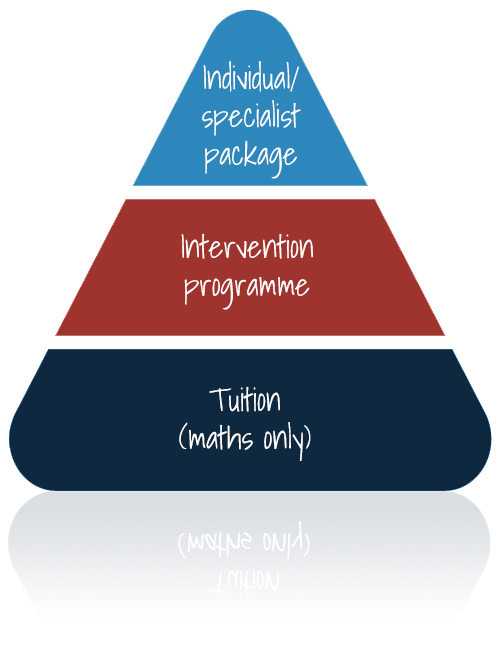 Tuition is often delivered over a period of time and has a broad focus on a curriculum subject, for example mathematics. Tutors work alongside the curriculum being taught in schools, addressing the child’s misconceptions, supporting them to understand and providing additional practice. This generally supports the child’s overall achievement in the curriculum subject. Intervention is focused teaching on one or two specific skills. Students needs will be assessed and the student will be taught over a period of 6-12 weeks using well researched intervention packages and teaching methods to target and achieve specific goals and develop their strategies to apply in the future. Specialist packages: – students also receive in depth assessments for areas of specific difficulty, sessions are then planned specifically for the individual and delivered over a number of sessions using specialist teaching methods.